Pharmacoepidemiology and Pharmacovigilance: Synergistic Tools to Better Investigate Drug Safety examines the role of pharmacoepidemiologic studies in drug development and its use as a prevention tool in pharmacovigilance activities. 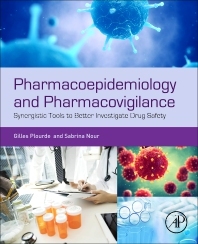 The book introduces the various epidemiologic tools and study designs commonly used for the surveillance of drug-related adverse effects and reviews the strengths and weaknesses of each. Criticisms surrounding pharmacoepidemiologic research and issues that often interfere or complicate the conduct and interpretation of these studies are also explored. Case studies illustrate the passive and active surveillance of adverse drug reactions in clinical situations, covering important pharmacoepidemiologic concepts like health risk management and safety. The book helps pharmaceutical industry groups engaged in drug safety, clinical investigators, medical evaluators and those seeking regulatory approval enhance the safety of the drug development process for all patient populations. Chapter 3: Pharmaco-epidemiology in the prevention of adverse drug reactions. This chapter illustrates, in a more concrete way, the information provided in the first sections of this book. Each case study illustrates a ‘real-life’ scenario and is composed of questions and answers based on appropriate clinical situations in order to provide all the necessary tools to all the partners involved in the passive and active surveillance of adverse drug reactions. These case studies also discuss important concepts related to pharmaco-epidemiology including Health Risk Management and safety measures; disproportionality analysis in spontaneous case reporting; and the use of superiority trials to establish drug safety and others. Sabrina Nour is a Clinical Evaluator and Epidemiologist where she is in charge of reviewing the efficacy and safety of biological products. She holds a Master’s degree in epidemiology and a certificate in population risk evaluation and health management. Sabrina has acquired more than 6 years of experience working on drug safety and pharmacovigilance, including pharmacoepidemiology. Her major interests lie in pharmacoepidemiology methodology, pharmacovigilance activities, and in the influence of health policies on populations. Dr. Plourde is a senior clinic evaluator for the Health Canada’s regulatory agency. He is an associate professor in the department of clinical pharmacology and physiology, Faculty of Medicine at the University of Montreal and at the school of physical activity sciences, Faculty of Health Sciences at the University of Ottawa. He holds a doctorate in medicine (MD) from the University of Montreal and a PhD in experimental medicine from Laval University. His studies led him to publish several articles in highly rated peer-reviewed journals and to make numerous presentations for prestigious national and international associations. He has more than 12 years’ experience working on drug safety, especially for biologic products involved in the treatment of various cancers. He has also supervised many students and employees interested in the prevention of the adverse effects of health products both in clinical research and/or when health products have obtained marketing authorization.